I don’t make a habit out of drawing parallels between my life and the life of a Disney princess, but I just finished watching Disney’s Tangled and found some intriguing similarities that might be useful for explaining my faith journey. Tangled, which is an update of the German fairy tale Rapunzel, follows a young girl who has been locked away in a tower in a remote part of the kingdom. Her guardian, Mother Gothel, constantly tells her how dangerous the outside world is and that she needs to stay inside the tower for protection. All that Rapunzel knows about the world outside is from a few books lying around and what she can see from her window. Whenever she expresses a desire to go outside and explore, Mother Gothel responds by feeling betrayed and dishonored that the girl would not recognize that she had done so much for her and was only trying to protect her. “Rapunzel, why can’t you just be happy with all that you have and the protection that I’ve given you?”. Mother knows best, she often repeats. Eventually Rapunzel tires of the solitude and confinement, yearning to seek the adventure outside. The simple, trite responses that Mother Gothel gives to her deep, probing questions seem insufficient and she feels like she’s missing out on a lot that the world has to offer. There very well might be dangers about, but she needs to set her own course in life, making her own decisions and learning from them. Although viewed as rebellion, Rapunzel makes the decision to take a leap of faith and leave. Finally outside exploring the enormous world outside, she discovers that there is indeed danger lurking about, but that there is also indescribable happiness, adventure, and opportunity. Once she leaves the tower, no amount of setbacks are enough to ever cause her to want to go back to the tower. By this point, some may be wondering why a post about Rapunzel is filed under the Religion category. Others might see the foreshadowing of a common theme in LDS counsel: holding to safety the iron rod, a.k.a. strait is the gate, and narrow is the way, a.k.a. strict obedience to the prescribed path, and so forth. Since having a blog is about all about being narcissistic ;), I wanted to write about why I’ve left Rapunzel’s tower. As a disclaimer (much of what I say should have an implied disclaimer), I’m not saying that I think my view is the best one, the only one, or that it will work best for many or all people, or that people can’t be happy or spiritually fulfilled where they are. This is simply my explanation of how things have gone for me and what resonates with me. (I really like the word “resonate” :D) I find it really challenging to write on this kind of topic without appearing elitist, condescending, more “enlightened” than others, etc. So I really hope nobody feels like I’m talking down on what works for them. The main purpose of this blog for me is mainly to explore my thoughts. And just to be explicitly clear up front, I’m not talking about renouncing my religion, although I do readily admit that I view things quite a bit differently than the traditional Mormon does. But to me (again, re-read my disclaimer), all of this often amounts to staying locked up in Rapunzel’s tower. I hit a point in my life where I felt my faith stagnating and losing meaning. Joseph Smith was a cardboard cutout of a legendary superhero that didn’t resemble any real human being. The refrain of “follow the prophet” increasingly caused me a headache and struck me as an attack on free agency, personal accountability, and the development of independent thought that is absolutely essential in the path to Exaltation. “Milk before meat”, they say, but where’s the meat? I found many questions with no substantive answers, not to mention that this steady milk-only diet was causing me to starve. The advantage of staying in the tower was “certainty” and safety, but it was becoming increasingly hard to make this work for me. The more I pondered, the more I felt that any beliefs worth having needed to hold up to any questioning, historical facts, and logic I might run across. I wanted to question openly, and explore doubt as an essential part of belief. “The truth will set you free“, it is written. So I left the tower, completely oblivious as to what I’d find, but hungering for something deeper and bigger. Now that I’m out of the tower, I could never return and make it my home. I can testify that there are certainly dangers out here, but there are also treasures I never could’ve imagined before. I’ve turned my back on the safety of having others spell out for me which path I should take, but it’s extremely liberating to feel like I’m ultimately the one in charge of deciding what is best for me and what God would have me do. Now this doesn’t mean that I have rejected all the current counsel, teachings, and doctrines of the Church (i.e., I do retain certain a certain fondness for when I visit the tower on occasion), but it does mean that I carefully scrutinize them rather than accepting them automatically. When I realized that this sense of “unknowing” could become detrimental to my commitment level, I decided that commitment was still important, so I decided to re-commit to those principles and ideals I felt were most important. Being outside the tower has certainly shuffled the priority of those principles, but I feel like I can sort through them much more clearly than I was able to before, and I feel more passionate about committing to them. I feel more authentic. When I choose to believe in something, I feel I’m doing with my eyes wide open (or at least to the extent possible). Just like Rapunzel, I sometimes look back at my days in the tower and miss the simplicity and comfy feeling I remember having. Outside the tower, there are bumps and bruises I wouldn’t have to deal with inside. I’ve given up the feeling of certainty I used to have (although I often wonder if it was just an illusion in the first place). Oftentimes decisions that were once so easy to make are much more complicated (but other decisions are far easier). I can feel my spirituality growing and maturing once more, whereas before it was lapsing into a coma. We should continue to become acquainted with human experience through history and philosophy, science and poetry, art and religion… One of the most important things in the world is freedom of the mind; from this all other freedoms spring. Such freedom is necessarily dangerous, for one cannot think right without running the risk of thinking wrong, but generally more thinking is the antidote for the evils that spring from wrong thinking. More thinking is required, and we should all exercise our God-given right to think and be unafraid to express our opinions, with proper respect for those to whom we talk and proper acknowledgment of our own shortcomings. I don’t really know why my mind works this way or what really triggered this change in my thinking. I have sometimes fallen into the trap of ascribing it to my intelligence or knowledge, but I ultimately must concede that this is not the case. A friend once shared with me the statement, “Questioning and doubting are a factor of personality, not intelligence.” My desire to explore wasn’t due to intelligence; it was due to something inside me that I could not quiet. Spiritual leaders often counsel that pride can have a detrimental effect on faith, and I can affirm as well as anyone that this is true. There may be an inherently prideful or rebellious aspect in being so insistent on choosing one’s own path, and maybe I’m just one of those people that has to learn things the hard way, but I know that God knows my heart and knows that I’m sincere and earnest in my seeking, and that’s really all that I need to know in order to move forward. This was beautifully written. This mirrors my journey with Mormonism as well. I appreciate how much you emphasized that your goal was not to be elitist or invalidating of other approaches. Like yourself I have felt that Mormon doctrine often misses the mark. It’s explanations often seem to be inconsistent with my observations of reality. Because of my past with Mormonism, I still like much about it but the pressure to accept it only one way is forcing my out. It’s so hard to be rejected by such a kind and christ-like community but I patiently continue to give them opportunities to think about how they are going to deal with someone like me, someone who is simply not convinced of the claims but finds value in many of the concepts. Time and time again the message I hear is that most Mormons would rather revel in the idea of their exclusive truth rather than accommodate for people who must explore this world with greater scrutiny. Even if it is friends, family or loved ones, the typical Mormon is not usually willing to loosen their grasp on absolute truth. They love the idea too much and apparently they often love it more than their loved ones. It’s interesting to me that he says this desire to bring the world of faith and observation together will lead to misery. It is absolutely true, but it is ironic that E. Nelson is nurturing the behavior in others which will bring about that misery. Marginalization is a deeply painful thing to experience and perhaps I will only be experiencing misery as long as I believe that I need to maintain a relationship with Mormonism. Your quote from Hugh B Brown gives me much comfort but unfortunately I think that statement will fade and the LDS community will just be talking about E. Nelsons talk for a long while yet. Yeah, Elder Nelson’s comment disappointed me as well. I realize that the top brass doesn’t really know what to do with people like us, but when I hear comments like that from the official pulpit, it makes me feel like they’re not even trying to understand the perspective. Furthermore, when Nelson states that it “will lead to misery”, I feel like there are many artifacts inherent in LDS culture and teachings that seem to ensure that’s what happens, e.g. excluding family and friends from temple marriages, insisting on all-or-nothing/black-and-white perspectives on many issues. Mormonism has a colorful multitude of strains of thought running through, and I think everyone picks the ones that suit them best. Hugh Brown was a painfully rare voice, but that sentiment of personal accountability and independent thought is very dear to me. Nice! I think the message in “Bolt” is also very profound. The dog can’t just be a dog. Love it! Thanks for the recommendation. I’ll have to check it out. A friend forwarded me your blog. I really appreciate your thoughts. “Tangled” resonated with me as well. As one who stepped out of the Tower a year ago, I can tell you that the journey into the world outside is both agonizing and exhilarating. But slowly, you begin to see that all the forces conspiring to pull you back into the tower are social forces, not spiritual ones. I too felt like I had been living in a spiritual coma for years, suffocating my deep spiritual yearnings in order to just keep quiet and not rock the boat for myself or my family. Leaving has been the most spiritually rewarding decision I have ever made, and required more true faith and courage than I had ever displayed, a step into the darkness for which I have found new brilliant lights illuminating my way. I sat on an airplane yesterday and spoke with the elderly woman next to me for a long while. She was suffering emotionally, and I listened and felt true empathy for her, and we were both nourished by the human connection. It wasn’t until later that I realized it was such a nice conversation because the thought simply never crossed my mind that I must convert her for her to be happy and saved. My only desire was to reach out to her as a fellow traveler on the journey of life, not as someone who has been bestowed with God’s only truth. This is a very liberating realization. Nothing in my external life has changed, other than we now go to a non-denominational Christian church on Sundays, not because we belief if is “the Only True Church” but because it gives us an open theological structure and community of good people with which to celebrate life and practice charity. We don’t drink coffee or wine or have affairs or beat our children. We give 10% of our income to a variety of charities. We have family night on Mondays, we laugh and play and pray together. I pray, though when I do, my prayers have a different flavor then before, where rather than seeking a personal reply, I’m seeking to attune myself to the Divine Will, to find my place of “resonance” in the universe. (I like that word, too.) You should explore Zen Buddhism, and Christian Universalism. Lots of truth and opportunity for spiritual growth and tranquility there. We still do these Mormon habits because they are healthy and lead to happiness. Somehow, the Mormon church has led its members to believe that these lifestyle choices are the result of exclusive divine revelation. That’s simply not true. These habits, or similar ones, are found in many, if not most, religious frameworks. Live healthy, love one another, give service. Universal truths. You don’t have to be Mormon to access them. And you can access them out of love, not out of fear of punishment, or social guilt. My extended family are all Mormon, and they are baffled by our decision. They don’t understand how we could leave something that seems so comforting, so all-encompassing. It’s really rather simple: we had to leave when we discerned that it was not true, at least not in the way it purports itself to be true. That’s not to say it is not “good,” but “true” and “good” have two very different meanings. It’s my belief that most Mormons who have no yearnings for a deeper understanding of truth and the human condition will do just fine staying within the Tower. I think they can have their spiritual and social needs needs met, and live healthy and entirely fulfilling lives. And I think they will get where they think they are going someday, or at least something that bears a striking resemblance. I think God can use the Mormon church for his own purposes as a tool in the life of any member. In this way, I don’t regret my life within the church to this point, and now I feel that God is pulling me in another direction. The only cost that members will pay will be the opportunity cost of enhanced spiritual awareness in this present moment. For me, and I’m guessing for you, the quest for foundational truth, for the true authentic self, becomes an irrepressible driving force, like a seed sprouting in dark soil, bursting into the open air and growing towards the light of the sun. I wish you well on your journey outside of the Tower. Feel free to contact me for further discussion. It’s a brave step you’re taking, and it’s good to connect with whatever supportive friends you can. I agree with you that people can live healthy and fulfilling lives inside the tower, even those who recognize that they’re in a tower isolated from the outside. For the others that feel the “irrepressible driving force” and wanderlust to seek out beyond the tower, however, I think it’s often healthiest to explore. What a wonderful analogy. Excellent post! I resonate (I like the word too) with this notion. The idea that the “outside” world is frightening, evil, to be avoided, etc. is a concept used for control. Denying the institution’s desire for control is crucial in order to achieve true freedom. That being said, I’m trying to live both in and out. I’m part of the LDS active church community (even in a leadership position), while cultivating my embrace of the broader world and life experiences. Is this possible? I don’t know. Right now I’m feeling significant cognitive dissonance. But I want to believe it is possible. I like you, am in the same position. I remain in the church and serve in a leadership position. There is definitely dissonance there, but I have also found that there are more people out there that are still growing within the church framework and finding great happiness there. You will slowly find more and more of them. While the Bishop I serve with is very literal and black and white, I have still learned great lessons and seen how he has been guided by the spirit to do things differently than I would, but in some cases with great results. So that has been a surprising development. On the other hand, I have found that what I emphasize is different than before, and I sometimes get annoyed by rigidity to the handbook as opposed to saying, what could we learn from the Savior’s example? What would he do? It’s difficult to live one foot in, one foot out. I think as long as you feel like each path is heading in a similar direction, you can find ways to manage (this might necessitate viewing the church’s goals from a more distant perspective). I’m in an Elder’s Quorum presidency right now and the other guys are nice people and good to work with. I’m not sure I’d hold to a strict enough orthodoxy or commitment to be in a bishopric or something similar, but I try to create space for people who might typically feel unwelcome or out-of-place. Being able to sympathize with those types and build bridges of understanding is a very fulfilling thing. I had the exact same thoughts when I saw Tangled. Great post. I would only add that I actually think questioning/doubting is a big indicator of intelligence. It shows you’re curious, imaginative, and a free thinker. The greatest minds are usually free thinkers who were unafraid to take that leap of faith. Do people really believe that the truth will set them free? Is their faith worthy enough of being put to the test? Submitting your own ideas to scrutiny can be a big leap of faith. I love the quote by Hugh B. Brown. I really liked Tangled as well. In my case I feel like being cloistered in towers of safety and certainty and then becoming aware of stagnation and climbing down to new truths and experiences is a cyclical process that continues. My journey has kept me as a “true believing LDS” but my faith has certainly changed – matured(?) – and holds more capacity to be curious and not comfortable than previously. The analogy to leaving one’s cultural/religious beliefs does really resonate. I think you could swing it the other way as well. I have certainly been and known the believers who would rather stay safe in a clearly defined existence than questioning anything that authorities have said. At the same time I’ve known “religious” people that seem more open to the unknown than non-believers who can become dogmatic in their knowing disbelief. Thanks for what you’ve shared! Yes, I’ve found it true that non-believers can be just as illogically certain as well. Hugh B. Brown–I’m still searching for the next Elder Brown. The man was someone I can truly identify with… someone who I think is capable of understanding a person like me. I think the current lack of a voice like his is a tragedy. Great post. I saw the movie, but I didn’t consider the religious parallels. Love the analogy, and love the Hugh B.Brown quote. Personally, in my life, I have found that I got bumped and bruised despite trying hard to stay in the tower. If it did provide the protection it claims, I’d have no problem putting aside my doubts and staying. But if it affords no real protection, what’s the point of trying to maintain that certainty and sticking with it? I’ve known people that, try as they might, simply could not get the system to work for them. I think they owe it to themselves to try something else. I like your analogy, and as someone who is going through a ‘faith-transition’, I feel I understand where you’re coming from. However, while statements like the following ring true to me: “Now that I’m out of the tower, I could never return. I can testify that there are certainly dangers out here, but there are also treasures I never could’ve imagined before.”, I am curious about specific examples. What treasures have you found that you could not have in your previous faith paradigm? I like your question. I’m considering writing a separate post on that topic alone. Off the top of my head, I could give an example of bringing a diverse group of people to the table and enjoying many unique perspectives on how to best solve a problem or enjoy a situation. That’s how it feels to be (not specific, I know). I think that taking a step back from it all was necessary to shock my system a little. I’ve spent most of my life on the Wasatch Front where it’s easy to put your faith in cruise control and fall asleep at the wheel. This may be a big factor in why I felt like it was too cramped inside. I loved this post and can relate in every way. My wife and I began our journey out of the LDS tower about a year ago. We do not feel as if it was an optional journey but rather one that we simply had to take as we began to realize that the Church was not “true” in the sense that we had been taught all of our lives. This journey has cost us dearly in the association and love of many friends and family members. My father used to call me once per week when I was Elder’s Qourum President. In the past year he has called me exactly twice and both times were very strained (I have called him many times, however; as I refuse to give him up despite his struggle to accept that we are leaving the tower). Like you, we don’t feel as if we could ever go back to where we were but we do find that the longer we are out, the less threatened by the tower we feel. I think this is because we have realized that we will never allow ourselves to be confined in that way again. We have completely and permanently taken back control of our own spirituality. Because of this, we are now able to look back to our LDS faith and, much to Elder Nelson’s chagrine, pick and chose which parts of that faith continue to bring value to us. We do not attend LDS services but we do have a regular family night that may or may not be spiritually focused. We do not read daily from the Book of Mormon but we do continue to pray as a family multiple times per day. In short, we have transcended the “its all true or it is all false” mentality that we felt forced us out of the faith of our fathers. Leaving the tower and taking ownership of our spirituality has been the best and most difficult thing we have ever done. I will never again allow another individual or group of individuals to do the thinking for me. I will now be able to offer my children a much more robust moral decision making tool-kit than “well, what does the prophet say about this?”. My children will be free to have a much more authentic human and spiritual experience because of this gift that I am giving them at the cost of my family. It is ironic that the religion that claims to be all about family has created the thinking that has caused my family to be competely unable to embrace me despite the fact that following God means something different for me than it does for them. Derek makes an interesting point. At a point staying in the tower of organized religion (Mormonism) becomes uncomfortable and maybe the more comfortable thing is to leave and experience an easier way than being bruised and battered while trying to unite in faith with people whom you often disagree on very important things. But in my experience this has reinvigorated my faith and made me want to stay “in” so to speak. I think that some level of discomfort is good for us – believers and non. I like how Jeffrey Holland put it – something to the effect that the gospel is here to make the comfortable uncomfortable and to comfort the uncomfortable. The continual dialectic of seeking security when insecure and seeking insecurity when secure is a powerful and excited one. This is where the analogy breaks down for me. The church and its leaders (and God) are not in my experience Mother Gothel trying to keep me limited. That was my own projection of them and what they wanted me to be. I’ve become more comfortable acknowledging doubt while attempting to grow faith and have not felt labeled or criticized for my open acknowledgment of doubt. Rather I felt that many are open and share doubt and faith with me. 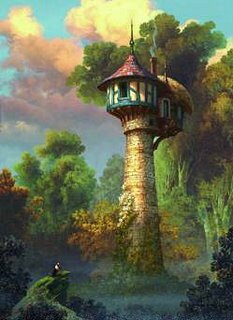 If the tower in Tangled represents something in my journey it is not my LDS ward or my LDS faith but rather the natural tendency (both individualized and institutional) to be right and hold dogmatic belief or unbelief that would keep me safe from challenging myself to grow. I admit that my ward is not typical in regards to politics – pretty moderate and even many real liberals mixed in with very level headed conservatives. But even in wards that I didn’t feel kinship of political/cultural identity I liked the challenge of getting beyond the stereotype that I projected on my brothers and sisters and finding out who they were as people. I didn’t always agree with their world views or understanding of faith but I felt uplifted, challenged and strengthened by the fellowship and shared worship of a loving God that wants us to leave (even when he has to tells us not to – Adam and Eve). Anyway, I can agree with much of what you said. Having explored the outside world can make it possible to return home to the “tower” on your own terms and often improve the experience. I like the idea that religion is meant to comfort the afflicted and afflict the comforted, so long as it’s not a permanent affliction. I identified with this movie as well… For the same reasons. Mother Gothel at the beginning of the movie caused a physical reaction. I felt sick. And watching her emotional back and forth when she left felt so familiar! There was a little hyperbole in that statement perhaps, but it does seem to be a one-way street. Now that you are proactively choosing your beliefs with your eyes wide open, I am interested in hearing the story behind how you independently came to the above conclusion. I should note that I’m using the word “know” in the sense that I have a strong faith-based conviction of something. But, interesting question. Maybe you’re alluding to the fact that a more traditional Mormon might define their standing before God by metrics such as holding a temple recommend or leadership calling or wearing white shirts every Sunday, whereas someone who’s doing their own thing also has to determine their own metrics? Anyway, I’m a big believer in the idea that “by their fruits ye shall know them”, and when I am happy and fulfilled in life, and feel love towards others (let’s also throw in a “fruits of the Spirit” reference), I feel like I’m on a path that God approves of. So, in brief, having the sense that I’m doing what I can to have an open heart and mind and aspire to those qualities Jesus was most known for teaching, and that it brings me a great sense of peace, well, to me, that’s religion done right. I would LOVE your permission to repost this on my blog verbatim. LOVED it! I will send people here when they ask where I currently stand with the church. I especially connected with your paragraph on commitment and authenticity. Great stuff. Thanks. The post “resonated” with me as well, as a Mormon Church member with a flagging testimony. Despite being a movie buff, I confess I have only seen the first half of “Tangled,” and dozed off and on at that. Like Jen, I also reacted heavily to the evil Mother, probably because my own Mother is supremely critical. I plan to watch the entire movie soon, which is a gem in the world of big-budget CGI films. My wife and kids sure loved it. Absorbing the locked-in-the-tower analogy however is what I am sure I will enjoy best. I felt it wasn’t reasonable to have to wait that long to find peace. The clincher was when I was teaching a lesson in Elder’s Quorum one day and I asked the brethren to, if willing, share a special experience regarding miracles. As you might expect, I received the usual answers. “Penicillin” is a miracle! “Modern science is a miracle!” Sorry, but they are not miracles. They are science. The responses continued. “Our second baby was premature and went to NICU. We gave her a blessing. And TEN DAYS LATER she came out fine and has been healthy since.” Basically a re-hasing of the “modern science” miracle. I better stop there before this becomes a blog post of my own. Thank you for having the courage to share what is in your heart. As a Mormon I understand the risk of opening up about religious questions. Family and friends are generally unkind to any hint of going against the standard line. I hope your family and friends are truly like the Savior, and love you the same either way. As far as spending an entire life without an answer to a major conundrum, I believe that flies in the face of the most important role of religion: to provide meaning and peace in life. “Men are that they might have joy”, we read. How long should someone be expected to forsake joy in this life in anticipation of relief? Hey Trevor… so I finally just watched Tangled tonight and then had to come over here and read this again. The analogy is so apt. I was very struck by the parallels. I’m still working through the ways that the “Church” can be like the emotionally abusive Mother Gothel. I think seeing that connection disturbed me the most. I’ll be pondering this movie analogy for awhile. Thanks again for the post! I appreciate your post. I too saw Tangled in a religious light, but viewed it exactly the opposite. Because Mother Gothel was evil, I saw her as being of the world and holding Repunzel prisoner, trying to keep her from finding the lanterns which led her to her Father’s kingdom. I think if we have faith and we endure, letting go of those who we feel abuse their leadership or lose sight of the meaning of Mormonism (which very much should be trying to be like our Savior – ie.accepting, loving, non-judgmental), we will find the path that leads us back to Him. The tower represents spiritual prison, and exactly what the adversary wants..no agency..just staying where is comfortable. The lights “spoke” to Repunzel and she knew they were for her. If we allow His Spirit to speak to us, we too can follow His light and we will be led back to where we belong. Sorry for the long analogy. That is just what it meant to me. I know it can feel sufficating sometimes, but being Mormon is a blessing and the knowledge that comes with it brings responsibility to Endure to the End. Praying that we can continue to do that. I know it is hard for me to do sometimes.